"We have got a couple of critical fire days ahead," Steve Segin of the Rocky Mountain fire-incident team told The Denver Post. "It is going to be very active. We haven't had a fire season this bad since certainly 2002." Check out The Denver Post's map of the multiple fires burning in Colorado currently. Relative humidity levels were near zero over the weekend and temperatures soared to triple digits. Firefighters use a scale to measure the conditions for growth potential -- called the "Haines Index," a scale of 1 to 6, with 6 being the worst -- and a level "6" was reported by fire authorities both Saturday, Sunday and Monday. The National Weather Service has issued a Red Flag Warning for much of the state and fire zones over the weekend and is still in place Monday. The Haines index remains at "6" through Tuesday morning. High Park Fire: The largest of the Colorado fires currently burning is now the second largest fire in state history as well as the most destructive. 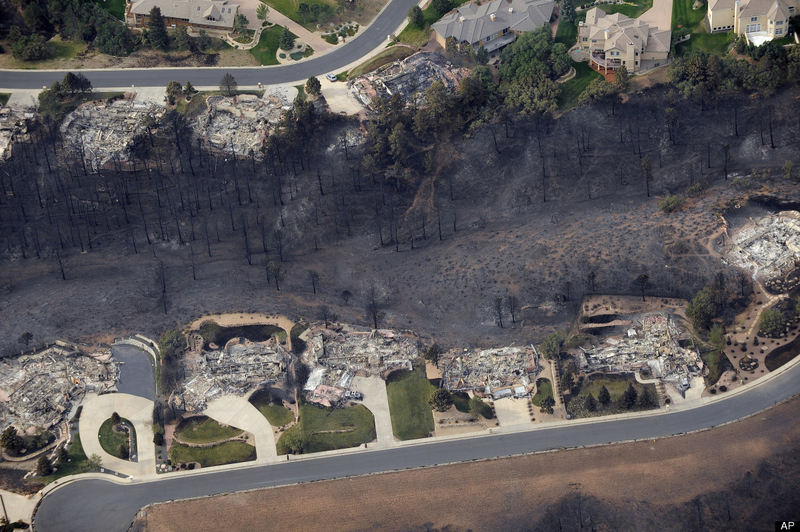 The fire has burned more than 87,284 acres and destroyed 257 homes so far. High Park Fire is 65 percent contained as of Wednesday. Waldo Canyon Fire: Burning west of Colorado Springs, the Waldo Canyon Fire has burned nearly 15,000 acres as of Wednesday -- doubling in size overnight. 32,000 residents were evacuated Tuesday night when the fire began to surge anew. An unknown number of homes have been consumed by flames. Flagstaff Fire: Burning near Boulder, the Flagstaff Fire started Tuesday afternoon. It has burned approximately 230 acres and prompted the evacuation of 28 residents. An additional 2,416 pre-evacuation notices were sent out to residents near the fire to remain on standby in case the fire got out of control. Little Sand Fire: Burning for more than a month now, Little Sand Fire has consumed 22,440 acres as of Monday with firefighters having reached 31 percent containment. Located 13 miles northwest of Pagosa Springs, authorities believe the fire was started by lightning in the San Juan National Forest. Treasure Fire: Burning near Leadville, Treasure fire began burning on Saturday afternoon. 320 acres have been burned as of Tuesday and the fire is 10 percent contained. The source of the fire is still under investigation but is suspected to be human in cause. Weber Fire: Burning near Mancos, the fire is estimated to be burning 9,155 acres on Monday, according InciWeb.org, after rapidly tripling in size over last weekend. 512 firefighters are battling the fire which is 30 percent contained.